Richard Edwards was born circa 1715, and had a long career in the Royal Navy. He was appointed lieutenant in 1740, and captain in 1753. 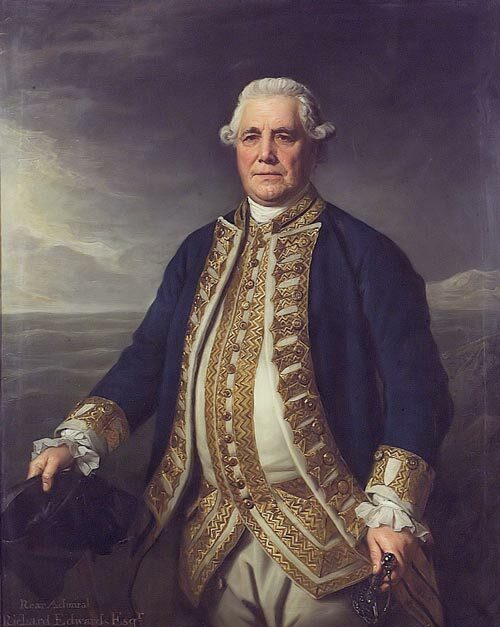 In 1757, he was appointed governor of Newfoundland, at a time when Britain was at war with France. Edwards' main concern was the defense of the Island. Ships were instructed to capture French vessels and the militia was re-established as a defensive measure against French attacks. The Irish poor were watched closely for suspected disloyalty. However, he was not as strict as his predecessor, Governor Dorrill, in sending transients back to Britain at the end of the fishing season. In 1779, Edwards was re-appointed governor for a second term. He was again concerned with strengthening the colony's defenses, this time against American privateers. He ordered the construction of Fort Townshend and other batteries, including those at Quidi Vidi and Petty Harbour. In May 1780, he recruited 400 men and formed the Newfoundland Volunteers under the command of Robert Pringle. They disbanded after the British government failed to lend its support, but Edwards authorized the formation of the Newfoundland Regiment, an infantry unit in the fall of the same year. Edwards was involved with a problem of legal jurisdiction that remained unresolved throughout his second term. He presided over civil and criminal cases, but he was only authorized to hear civil disputes. Newfoundland's status to the British government was unclear, and the lack of judicial power made court case decisions uncertain. Edwards left Newfoundland in 1782. His naval career continued with promotions to vice admiral in 1787, and admiral in 1794. He died in 1795.